The intro track, Which Side Are You On, features St Louis (Ferguson) emcee Tef Poe, singer Kendra Ross and production by VA emcee/producer Nottz. The track starts off with the chant "Which side are you on, friend? Which side are you on?/ Which side are you on, friend? Which side are you on?/ Justice for Mike Brown, justice for us all/ Justice for Mike Brown, justice for us all." This chant has been tailored for many occasions, to bring attention to public outcries that normally involve social and civil injustices. This track of course samples a recording (or at least that's what it appears like to me) from a gathering of people protesting and mourning the death of 18 year old Michael Brown at the hands of a Ferguson police officer on August 9th, 2014. Social activist and poet (and wife and daughter of coal miners) Florence Reece wrote Which Side Are You On? in 1931 to support the miners Harlan County strike. Folk singer and activist Pete Seeger was the first to record the song in 1940 and since then the song has gone through many iterations of singers and lyrics. Lyrically this song is very straightforward and candid. Kweli asks (and makes the blunt statement), "How a kid without a gun become a threat to cops/ When they let off shots, hoping that his head will pop and that his breath will stop?/ Gotta be satisfied with waiting until we get the verdict/ It's just perverted, no justice for the family of the kid they murdered." Talib Kweli has always been known as political and conscious, and to introduce the album with this track sets a precedence for the entire album and the Indie 500 movement as a whole. It makes sense that 9th Wonder would want to continue with the Native Tongues' message because both also have ties with the Zulu Nation (who also strive to promote a positive hip hop culture on an international level). And by joining forces with Talib Kweli, this new collective adds a progressive dynamic to the mix. 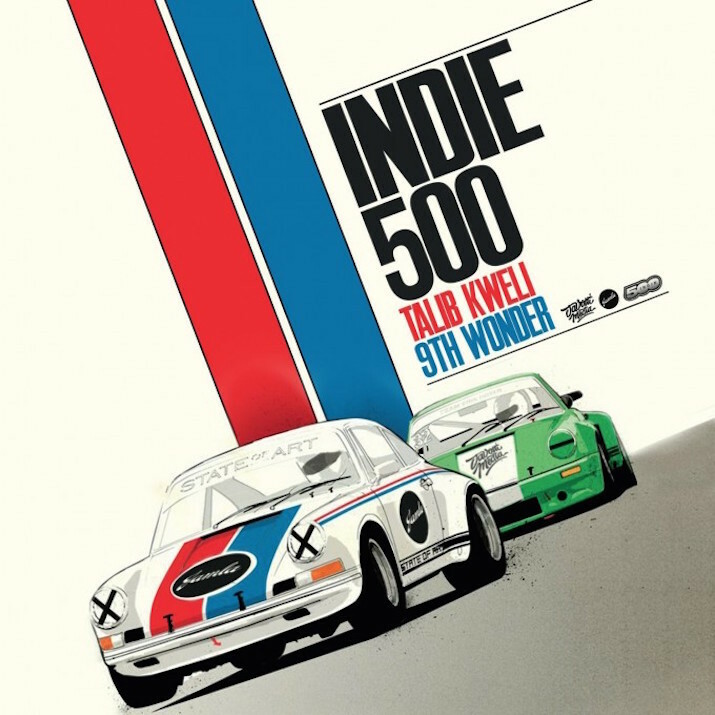 While the Native Tongues promoted good times/lyrics, positive messages and celebrating individualism, Indie 500 unfortunately has to address the current state of the nation. Of course it is important to have a good time and enjoy the day to day. But it also makes sense that conscious minded artists have an obligation to evolve with the times. Turning a blind eye to the realities of the new day to day would be a disservice. To continue the De La Soul fun and positivity is necessary or else we would be all gloom and doom. And no one wants to constantly be depressed and negative. But we also need some NWA and Public Enemy at the forefront too. And I think Indie 500 has the foundation to be this updated movement. They can be the movement that continues to promote and champion good lyrics and songs, but they also have the politically conscious intelligence to bring the serious and critical messages to the masses too. This album is a well crafted introduction to a movement that can fill a crucial gap missing in hip hop (pause?). 9th crafts the bulk of the sound for the album. Other Jamla producers and Nottz follow suite and create a synthesized sounds that tie the album together flawlessly. There are no mainstream features either (I guess Rapsody and Pharoahe Monch would be the "mainstreamier" emcees). Instead Talib Kweli is joined by like emcees with similar skill sets in terms of messages and storytelling. This album is definitely not made for the club or for radio spins. And unfortunately the demographic that this album is meant for appears to be in the minority. But for those few, end the year off right and take Indie 500 for a spin.